This simple two-word phrase, which had lain dormant for decades, was suddenly placed front and center in the 2016 Presidential campaign of Donald Trump. For the Trump campaign, unconcerned about historic meanings or previous connotations, “America First” in 2016 meant higher tariffs, protecting Midwestern manufacturing jobs, trashing NAFTA and turning away from NATO and other longstanding global alliances. 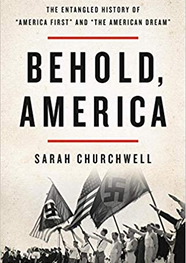 As Sarah Churchwell explains in her new book, “Behold America,” Trump adopted the phrase as a wedge issue, designed to polarize Americans along racial and geographic lines and peel off blue-collar Democratic voters. There is a great historical irony in his provocative use off the phrase, because “America First” had first entered the national political dialogue in 1915 when a progressive Democrat, President Woodrow Wilson, sought to unify the country during the horrifying first years of World War I.
Wilson, running for re-election in early 1915, used the phrase to justify non-intervention in the bloody conflict. In a major political address, he advocated a carefully calibrated American neutrality. So how did we get from that benevolent meaning of “America First” to its use as a provocative threat by candidate Donald Trump? Churchwell, professor of American Literature at the University of London, unravels the complicated history behind the “America First” and the equally problematic phrase, “the American Dream” in her new book Behold America. Churchwell reports that the first written use of the phrase came in 1884, when an Oakland, California newspaper ran “America First and Always” in the headline above a report on a looming trade war with the British Empire. It fell into disuse until President Wilson resurrected it in his 1915 re-election campaign. In April 1917, America declared war on Germany and the concept of a “fair-minded” neutrality vanished. After the World War ended and the Versailles Peace Treaty negotiated in 1919, the phrase “America First” continued to be used, but with new meanings. According to Churchwell, the massive Harding victory (he won 60 per cent of the vote) “legitimized” the phrase for many Americans. It was soon adopted by anti-immigrant and anti-Catholic groups including the newly resurgent Ku Klux Klan. For these groups, “America First” meant White supremacy and returning the nation to its “Anglo Saxon” or “Nordic” origins, and restricting immigration from Italy and Eastern Europe. The 1924 President Calvin Coolidge signed the Johnson-Reed Immigration Act, which fulfilled the hopes of those who saw “America First” as invocation of racial supremacy. The new act severely restricted immigration from southern and eastern Europe by imposing quotas based on the 1890 census. It also, in effect, banned immigrants from China and Japan. In the 1930s, as the nation descended into the Great Depression, references to “America First” rapidly declined. In 1940, however, the phrase roared back into national prominence with the founding of the America First Committee (AFC), which chose aviator Charles Lindbergh as its spokesman. The AFC, funded by wealthy businessmen and run primarily by Ivy League law students, was launched nationwide shortly after Germany conquered France. The committee claimed 800,000 dues-paying members within its first year. The AFC vehemently opposed American entry into World War II and directly attacked President Roosevelt’s aid to Britain. Charles Lindbergh, speaking at rallies across the country, suggested that American Jews were behind the effort to support Britain because they were angry at Germany for its vicious anti-Semitic policies. On December 7, 1941, Japan bombed Pearl Harbor and America entered the war the next day. The America First Committee collapsed overnight. While the majority of “Behold America” is devoted to exploring the tangled evolution of “America First,” Churchwell also examines the changing meaning of “the American Dream.” Trump, of course, famously declared “The American Dream” is dead in his campaign speeches, blaming the loss of upward mobility on unfair competition by China and a “flood” of immigrants. As Churchwell noted in a recent interview with Smithsonian magazine, “the American Dream” has always been about economic success, but 100 years ago “the phrase meant the opposite of what it does now.” It was a “dream of equality, justice and democracy,” not just a vision of a large house full of expensive possessions. “Behold America” is extensively researched and generally well written, guiding the reader through a century of political dialogue. However, it is a one-dimensional work dependent on newspaper articles, editorials and letters to the editor. It is an etymological study of two specific political phrases, rather than a broader look at America’s self-image. Churchwell bases her research exclusively on print sources, citing hundreds of newspaper articles and handful of novels. She only mentions one movie: D. W. Griffith’s “Birth of a Nation” (in 1915 it became the first film ever shown in the White House). She also completely ignores theater, music and radio, despite the fact that broadcasts reached millions of Americans in their home. She skips over President Roosevelt’s “Fireside Chats” on radio and the widely popular weekly political commentary (often openly anti-Semitic) of Detroit’s Father Coughlin. She also ignores the motion picture industry. Hollywood had a major influence on American perceptions of opportunity and social justice. One only has to think of movies like The Grapes of Wrath, Mr. Smith Goes to Washington or It’s a Wonderful Lifeto realize how they shaped depictions of the American Dream. Behold America brushes aside the impact of these newer, influential media. Perhaps Churchwell’s reliance on print sources is due to her background as a professor of Literature. Her previous books include Careless People: Murder, Mayhem, and the Invention of the Great Gatsby.